When it comes to thrifty home solutions in Bloomington, IL, Residential Electric Heating, Cooling & Insulation proudly offers retrofoam insulation. Rather than sit by as aging insulation causes your heating and cooling expenses to soar, you could opt for our retro fit insulation. It will renew your property’s ability to maintain comfortable temperatures, which will translate into less spending for you in the long run. With energy costs on the rise, RetroFoam will pay for itself with the money saved on your utility bills! 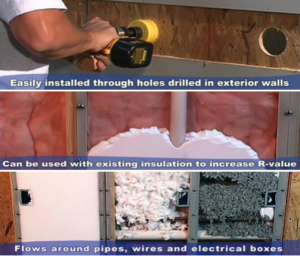 And, since it’s not necessary to tear out walls or remove old insulation, Retrofoam costs less to install than any other re-insulation material! The trained professionals at Residential Electric, Heating, Cooling & Insulation know how important it is to find the right insulation contractor for the job you’re planning to execute. When looking for an insulation contractor in Bloomington or the surrounding areas, you can’t do any better than Residential Electric, Heating, Cooling & Insulation. Give us a call today to learn more. Insulation contractors are certified professionals specially trained to supply and install insulation on any residential, commercial, or industrial building, no matter the size. They also work with the plumbing, heating, and air conditioning contractors in order to efficiently and completely execute a project. We’re proud to offer insulation contractor services to not only Bloomington, but also El Paso, Eureka, Gibson City, Piper City, Monticello, Lincoln, Atlanta, Champaign, Clinton, Pekin, Normal, Fairbury, and Pontiac. If you’re a resident or business owner in one of these cities and need the help of a certified insulation contractor, call Residential Electric Heating, Cooling & Insulation today. We make sure your insulation contractor needs are met. Call Residential Electric Heating, Cooling & Insulation at 309-829-4230 to learn more about how one of our insulation contractors can benefit you and your family.